Durable woodgrain laminate is water-, scratch- and dent-resistant. Cut-away base design increases legroom. 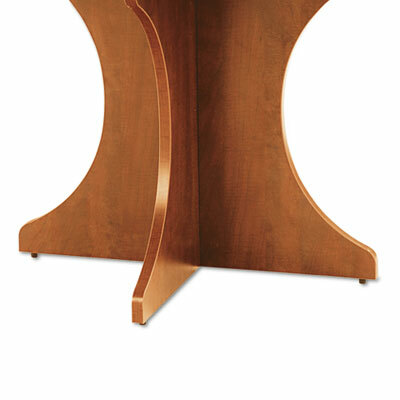 Includes two 15" legs for round table top and two 30" legs for racetrack table top. An ideal addition to your office or conference room. Durable woodgrain laminate is water-, scratch- and dent-resistant for long-lasting good looks. Sculpted cut-away design increases legroom. Adjustable leveling glides compensate for uneven floors. Includes two 15" legs to create an "X" base for round table top and two 30" legs for use with racetrack table top. Top and Base sold and shipped separately—ORDER BOTH.